he 2017 cedar fever season turned out to be one of the worst ever. According to KXAN, the cedar pollen count on December 29, 2016 was the second highest in recorded history. Abundant rain earlier in the year helped produce a bumper crop of malicious pollen. The 2018 season could be even worse. The torrential rain from Hurricane Harvey has breathed new life into all of the region's flora, including cedar trees. The source of the seasonal scourge known as cedar fever is actually the Ashe juniper (Juniperus ashei). Though technically not a cedar tree, it’s also referred to as Mountain Cedar. The trees typically produce large quantities of pollen from January to February, but sometimes the season can last until March 1. However, the day-to-day weather can significantly affect the amount of pollen in the air. On cool, sunny and windy days, the pollen is sometimes so abundant that it looks like smoke. The fire department routinely deals with false alarms, particularly in cedar-rich west Austin, during the season. 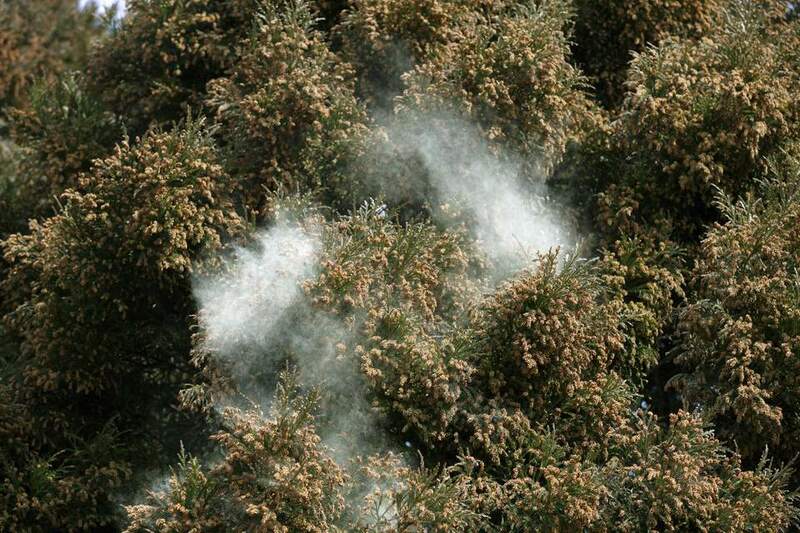 Even people who don’t normally have allergies can be affected by the Ashe juniper pollen. The microscopic pollen grain is shaped like a spiked mace, which means it produces irritation from contact alone, in addition to allergic inflammation. Symptoms can include extreme fatigue, headaches, stuffy head and itchy eyes. Newcomers to Austin sometimes have a honeymoon period of about two years without any symptoms at all. That’s why it often comes as a shock when previously allergy-free people are slammed unexpectedly in their third year in central Texas. In 2015, Flonase became available as an over-the-counter treatment. A year earlier, a similar product, Nasonex, was approved for over-the-counter sales. These are both corticosteroid nose sprays. They are generally considered the “big guns” of cedar fever treatment, but consult your doctor before using them. They do have side effects. Some people get severe back and neck aches after stopping corticosteroid nose sprays. Allegra, Claritin, Sudafed and their generic counterparts may provide some relief, but they are often not formidable enough for this foe. An Austin company called Herbalogic has come up with a novel approach to treating cedar fever. Its Easy Breather formula combines several ingredients often used in traditional Chinese medicine. There’s one addition that may make you cringe, but then again, you may not be bothered at all if you’re desperate for relief. In addition to well-known herbs like astragalus, angelica and mint leaf, Herbalogic adds pureed cicada shells. You’ve probably seen the brown, papery molting that cicadas leave behind on trees. It sounds odd, but many people swear by the formula. It’s available in capsules and in liquid form. If you’re in an allergy emergency, the liquid version will get into your system faster. At the Herb Bar, the proprietors sell a variety of allergy remedies. The most popular is the Herb Bar Special Blend Spray. Dr. Christopher Thompson of the Texan Allergy & Sinus Center is conducting a clinical trial of intralymphatic immunotherapy for cedar fever. The treatment involves injecting a small amount of allergen directly into the patient’s lymph nodes. This more direct route into the immune system promises to be much faster and more effective than traditional immunotherapy for sinus allergies. In initial testing, the approach has been successful in as few as three treatments. Compare that to the several years required to get results from weekly injections in standard immunotherapy. While the treatment doesn’t sound pleasant, many of those who suffer from cedar fever are ready to try anything. The treatment isn’t yet available to the general public, but it may be available within two or three years. If you don’t mind a few needles in the face, acupuncture may provide short-term relief. Those with less severe symptoms may be helped by saline nasal sprays and neti pots, which physically wash out the pollen. Although Ashe juniper trees are native to central Texas, they were once few and far between. Naturally occurring wildfires and grazing wildlife used to keep the trees in check. Now they grow in thick stands on any untended hillside. The greenbelts in and around Austin are covered in them. Can We Just Kill Cedar? Some landowners have become downright obsessed with eradicating cedar. In fact, under the right conditions, getting rid of cedar can help conserve water. The tree does provide habitat for birds and other animals, so killing all of it would have negative effects on the ecosystem. The biggest problem is that it starts coming back not long after you kill it. Like it or not, the Ashe juniper is a survivor, and it will probably outlive all of us.